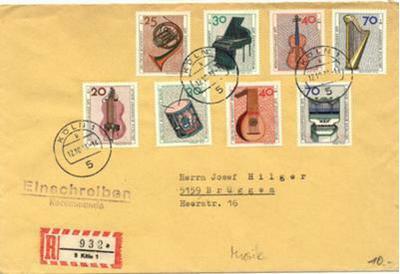 I recently got hold of an interesting envelope with stamps depicting historical musical instruments. Some haven't changes much! However, I was intrigued by the Drehleier (bottom left). 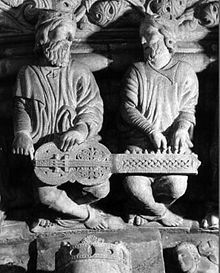 The English translation is literally "rotate lute" or commonly known as "hurdy gurdy" Quite an ancient instrument judging to the scuplture found in the Cathedral in Santiago de Compostella which shows two people playing this instrument - one turning the wheel that brushes the strings, the other working the "notes" in the neck of the instrument. Could this be a forerunner of the lute and eventually the guitar? Or do you think the lute (2nd from right, bottom on the envelope), so popular in the 18 hundreds, developed from something else? Does one still find lutes? Are there still people playing lutes, or have they completely been taken over by the modern guitar?